Do you know what triggers your workplace stress? Is it excessive meetings throughout the week? What about that Debbie Downer coworker? Take some time to think about possible sources. Once you pin-point them, either do your best to avoid your triggers or discover a way to resolve the situation. Being proactive is a great way to lessen your stress. Think ahead of the curve of possible upcoming projects or scheduled meetings and prepare for them thoroughly. Furthermore, let to-do lists become your best friend! Before you leave work for the evening, list out tomorrow’s priorities. Put top priorities first, so you know exactly what you need to tackle when you arrive at the office the next morning. Does your desk look like a disaster zone? Does your email inbox have a life of its own? Clean it all up! Mess only adds to stress, so having a tidy workspace (physically or digitally) will make a huge difference in your day. When your day feels like it’s going to implode, it’s time to walk away for a little bit. Visit a friend for a quick chat; fetch some water; go for a quick walk, or have lunch outside of the office. Physically remove yourself from a stressful situation if it escalates too much. Many times, we go home and still feel like we’re still at work. Smartphones can put your office at your fingertips regardless of your location. When you’re home, unplug. Do not check your email! You need time to refresh, so don’t rob yourself of those few calm hours at the end of the day by constantly looking at your phone. Exercise is a great, natural de-stressor! Make time a couple nights (or mornings, if you’re a morning person) a week for a good work out, and get ready to reap the physical and mental benefits of those endorphins! If your workplace stress load is starting to take control, talk to someone about it. Your family/friends, your boss, HR or even a professional counselor – you have plenty of people who will want to listen and help you. Workplace stress plagues many people, and if you are one of them, remember that there are ways to help alleviate it! Have an additional tip? Please leave us a comment! 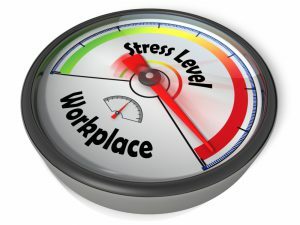 This entry was posted in Currently Employed and tagged managing work stress, stress at work, Work Stress, workplace stress. Bookmark the permalink.